This Salt & Pepper Chicken was actually mouthwatering, 1st time I had cooked this meal and I was very impressed with how it had turned out. It's extremely filling & packed with amazing flavour! 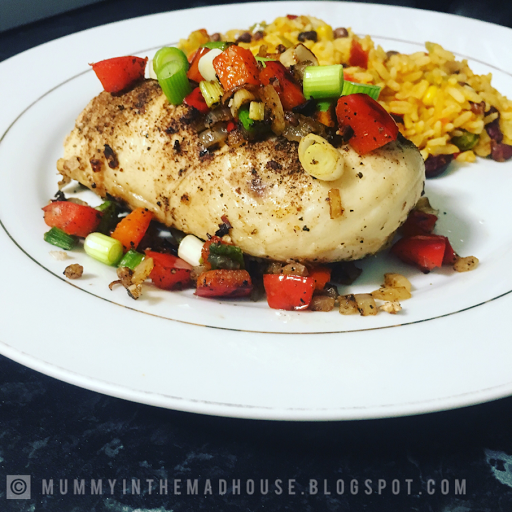 And again another Syn Free Recipe... This was a meal I made for just myself so I did alter the amount of ingredients I needed. With only 10 minutes preparation time & 40 minutes cooking, this is a meal I will definitely be cooking as a mid-week dinner for everyone as it's super easy to make and lets face it the afternoons after the school pick up can be chaotic enough as it is without having to stress about standing over a hot hob for hours just to make a healthy and substantial meal for everyone! Toast the salt flakes in a hot pan until they start to brown, it's important to do this to get the true S&P flavour! Mix the toasted salt and all the other spice mix ingredients together. Sprinkle the chicken fillets with a couple of teaspoons of the spice mix. Place them on a baking tray and cook per instruction packet, usually around 30 mins. When the chicken is cooked heat up a wok sprayed with some frylight. Add the spring onions, onion, chilli & peppers to the wok and cook till they start to brown slightly. Add the chicken fillets to the wok along with 1 or 2 tbsp of spice mix, add it in bit by bit not all at once, stop when it's spicy enough. Cook through for another 3-4 minutes, then served sprinkled with some finely chopped spring onions. 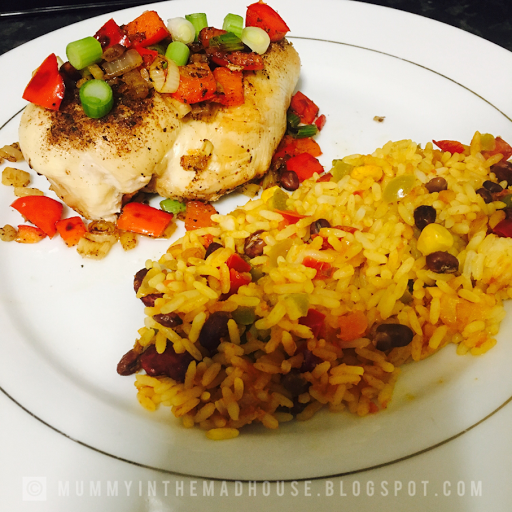 I served my Salt & Pepper Chicken with Mexican Style Rice, I was being lazy as it was a pre-made packet and pinged in the microwave, it was a Saturday night after all!